If you think girlfriends can be dumb and flip out for stupid things, let me assure you with the utmost sincerity that boyfriends are the real drama queens! You just need to play a simple prank on them – just say you got pregnant, and then grab some popcorn, make yourself comfortable, and watch while your boyfriend goes from a tad bit annoying to absolutely crazy! This girl didn’t mean to prank her boyfriend though. 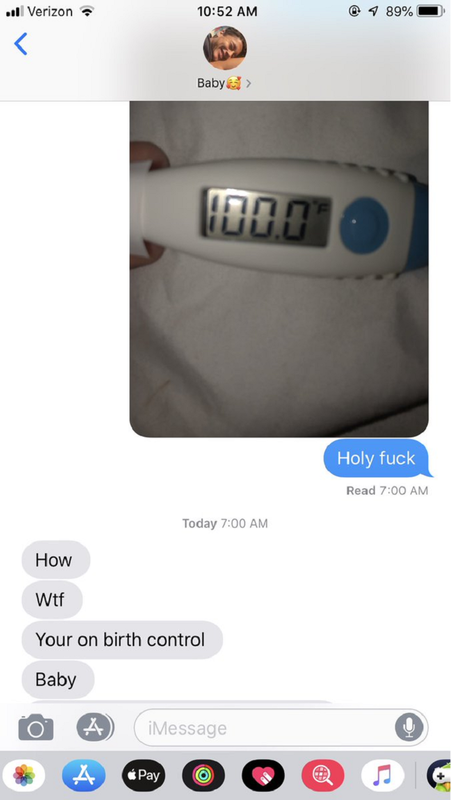 She was running a little fever and wanted her boyfriend to know. But who mistakes a thermometer for a pregnancy test? Well, this guy did! The guy thought that the “pregnancy test” read 100% pregnant (LOL), and immediately caught himself in a panic attack! Accept it, this is hilarious! If I was with a dude that couldn’t tell the difference between a thermometer and a pregnancy test…I’d be eating birth control like M&Ms. Get you a man who knows the difference between your and you're. Well, at least now the guy knows what a thermometer looks like!